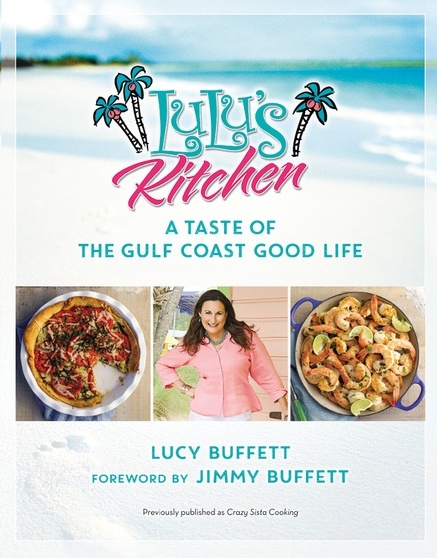 Summary: Updated with a new introduction and amazing photography, the bestselling, self-published cookbook by Lucy Buffett (chef sister of Jimmy Buffett) includes amazing recipes from her destination restaurant in Gulf Shores, Alabama. Like her brother, Jimmy, Lucy Buffett celebrates freedom, relaxation, and seaside decadence in her own art--cooking. This previously self-published book (formerly titled Crazy Sista Cooking) has sold over 70,000 copies without marketing or much trade distribution. It's been a long time since I've reviewed a cookbook here at Booking Mama! Life is crazy and, while I do cook most nights, it's the same old recipes because they are quick and easy... and my family seems to like them. So it took a special cookbook (with a special author) for me to start looking for new recipes. 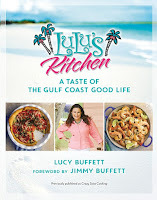 That cookbook is LULU'S KITCHEN: A TASTE OF THE GULF COAST GOOD LIFE by Lucy Buffett. LULU'S KITCHEN is a wonderful cookbook written by Lucy Buffett. The recipes come from her restaurants in Destin and Gulf Shores and is full of Gulf Coast cooking ideas. It was previously self- published ten years ago as CRAZY SISTA COOKING and sold over 70,000 copies. I consider that a success given that Ms. Buffett didn't have a powerful marketing campaign behind her! The foreward in the new book is written by none other than her brother, Jimmy Buffett. The author is quick to note at the beginning of LULU'S KITCHEN that this is not your basic "how to" cookbook. She wants the reader to feel as if they are visiting her kitchen with stories, music, and laughter. I think she definitely captured the look and feel in this fun cookbook. Plus there are over 120 recipes! The very first chapter of recipes in LULU'S KITCHEN is titled "How to Lulu," and it's filled with LuLu essentials including recipes for stocks, seasonings, marinades and more. I actually love this chapter! Not only does Ms. Buffett give step by step instructions for preparing these items, but she also gives a list of ten things she absolutely knows about cooking and ten ingredients for a healthy life. See what I mean about feeling like you "know" Lulu? The next chapter is titled Cocktail Hour, and I definitely think this section alone is worth the cost of the cookbook. There are 25 different cocktail recipes and they include more than a few of Lulu's specialities. Margarita fans will not want to miss this chapter! The next chapter, titled In the Beginning, is another winner. It includes some pretty fantastic-sounding Gulf Coast appetizers like Famous Fried Green Tomatoes, dips, and quesadillas. I am dying to try Lulu's Perfect Peel and Eat Shrimp along with the Crispy Coconut Fried Shrimp. This chapter is followed by one called Gumbo Love that includes five recipes for gumbo and other southern soup recipes. Sassy Salads, Sandwiches & Such, and Perfect Sauces & Salad Dressings round out the main courses sections of LULU'S KITCHEN. And then there's the dessert chapter titled Sweet Things. It's exactly what you'd expect -- Key Lime pie, banana pudding, and assorted chocolate cake recipes. It's the last few sections of LULU'S KITCHEN that make it truly special. There is a chapter for kids' meals that I have to admit looks awfully good to this adult. In addition, there is a chapter devoted to the southern favorite -- grits. And last but not least are Favorite Dinner Party Menus. There are meal plans and recipes for some great theme parties including a New Orleans Jazz Fest Thursday Dinner Party, a Montana Rodeo Picnic, and even a Traditional Unchristmas Dinner! LULU'S KITCHEN is a fantastic cookbook. I think Ms. Buffett captured the essence of a southern cookbook -- great recipes, traditions, and fun! Highly recommended for fans of southern/Gulf Coast specialities. Thanks to FSB Media for providing a review copy of this book. I don't cook like I used to and need to get back to it. This sounds like it has some great recipes.